The New Business Development Center (NBDC) is proud to offer consulting services from experts at Grand Canyon University’s Colangelo College of Business, along with other departments across the university. 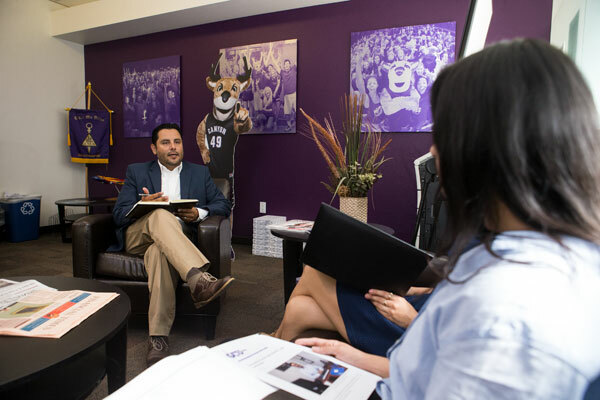 Graduate and undergraduate student ambassadors in GCU’s business programs support current and prospective business owners with training seminars and one-on-one sessions under the leadership of NBDC's consultants. As the New Business Development Center continues to grow, our hope is to offer a variety of training sessions in functional areas such as leadership, management, marketing, accounting, finance, e-commerce and the fundamentals of human resources. Our vision is to help fulfill GCU’s mission to minister to our surrounding community. We want to create a personal learning environment where the NBDC partners with local businesses to help achieve success. In the first year, the NBDC has offered consultation services to 44 students, 10 alumni and 164 local community businesses. We have awarded 196 Entrepreneurship Training Certificates, totaling 3,136 hours of professional development. We have increased the business acumen of our clients by about 13 percent on average, based on a pre-assessment vs. post-assessment. The Entrepreneurship Training Program consists of a series of on-campus seminars at no cost. Entrepreneurs receive a high-level introduction for opening and operating a small business via the Business Purpose Canvas as they transition their business idea into a viable business model. This program is offered in English and Spanish!